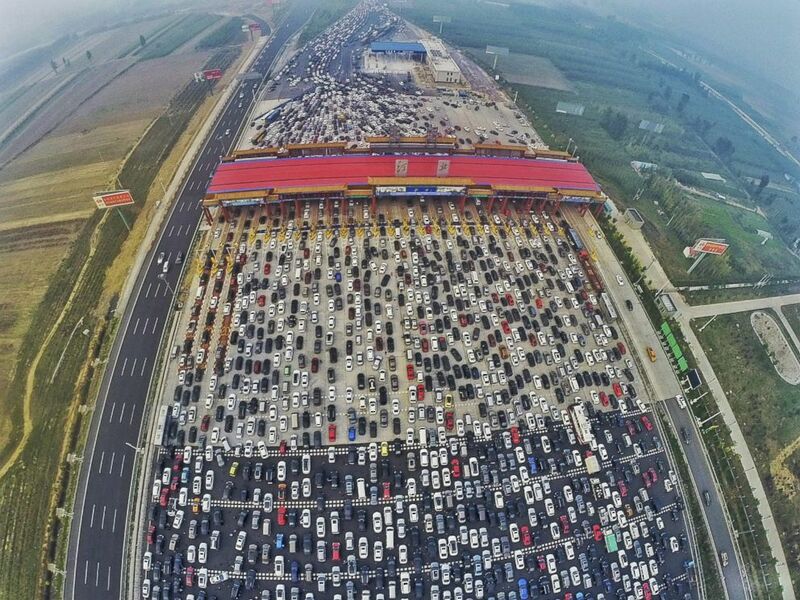 An article from the Daily Mail reports about a giant traffic jam near Beijing, China, in the aftermath of 2015's national holiday week. The jam began at around 2pm just outside the capital city on the G4 Beijing-Hong Kong-Macau Expressway, which has 50 around lanes. The congestion was caused by a new checkpoint at the other side of the toll, which reduced the width of the road from 50 to less than 20 lanes. This sounds like 50-ish lanes is the regular width of a part of the motorway, at least between a pair of very frequented entrances/exits. Alternatively, even if the 50 are not correct, the highway seems to regularly have 20 lanes. The traffic jam happened around a road toll booth, as is mentioned in the article and visible in the third photo. In particular, the third photo shows the vehicles are waiting in front of the toll booth, rather than after it. Typically, motorways get a lot wider for a few hundred meters in front of a toll booth, precisely because traffic is slowed down there, and parallelization helps. In the last photo, it even seems quite clear that the number of lanes is greatly reduced after the toll booth (possibly shrinking to less than 20 lanes?). According to the Wikipedia article, the G4 expressway was completed in 2004. Google Maps photos of the place appear to be from 2015, according to the footer. The depicted location, just about 40km South of Beijing (map markings are slightly shifted toward the East compared to the photos) shows expressway G4 to be a motorway with three lanes per direction. Neither does it seem likely that the motorway would have to be about ten times as wide only a few kilometers North of this, nor (if we assume the Google Maps photos are indeed some years old) that regular traffic volume could have increased that much within just a few years, to warrant such a drastic expansion of road width. Therefore, my question is: Does any part of the the G4 expressway (or any other Chinese motorway) indeed have a regular (i.e. not just around a checkpoint) width of 20, or even 50 lanes? The article refers to the northbound Zhuozhou Toll Gate at the G4 motorway just south of the Beijing city boundary. I know this is long since solved, but I was looking into it a bit. You can see that there is far more than 1 car per lane in the plaza. In fact I'm counting 50 cars across which may be where that number came from. 4 lanes on the left, for traffic coming from the other direction. 25 lanes in the toll plaza. 2 lanes on the right which an entrance ramp into the plaza. 2 lanes on the other side of the tree line on the right, which may be for service vehicles. 4 lanes on the right, for traffic coming from the other direction. Altogether this adds up to 60 lanes. If you only count the toll plazas that is 50 lanes. This could also be where the 50 lane number comes from. However outside of the plaza there is somewhere between 8 and 11 lanes depending on if you count the service lanes or ramps. Not the answer you're looking for? Browse other questions tagged china traffic road . Is the Katy Freeway the widest in the world?